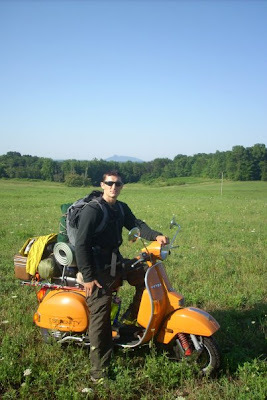 Riding long Distances on a scooter not only takes a great deal of Patience, but physical endurance and perseverance. While stuck here in Korea I have been Plotting and Planning a Trip in the Summer to Drive to the Southern tip of the country, and possibly take the Ferry to Japan. It would only cost 30,000 won which is only 20-25 dollars American. However the Ride If I understand correctly takes the better part of the day. But then nothing worth doing is easy. Running test here and there on the Dead Ped as far as Fuel Economy, Oil Consumption, Tire Life, and general ware and tare on it would give me an idea on how much is will cost in Gas, and Oil. I have Two Spare Tire/Rims. With a Giant Basket made of wire on the back. Although I do not have the numbers with me, I do have the Numbers for my Stella back Home. Given this is not a precise guide it is accurate enough to give you a heads up on when to perform simple maintenance. Before I left for Korea we had a few warmer days in the South So My friend Suleyman and I decided to take a camping trip via Stellas. Only having a estimated Round Trip of 225 its not terribly long, But it was Fun. This was also a test run for some of the gear I am planning to use on a cross country drive with the Stellas. One of the best things you can carry with you on a Long Distance Ride whether you’re a Pro or a Rookie is to take Two Large Terry Cloth Cotton Towels, and possibly a trash bag. Keep the trash bag in a cubby hole or something until you really need it. The towels act as a vibration Dampener from the 2 cycle motor below you. If it begins to rain then just take the towels folded up and place them in the Trash Bag. This will keep them dry and it still gives you cushion if you must Ride threw the Rain. Also if you happen to have a Hiking Backpack, This will do wonders for your ride. It forces you to keep your back in proper alignment, and keeps you from Slouching and giving yourself back pains from hours of riding. I will have a special Post late to give tips and example on what not to do and what to do when making the long haul. 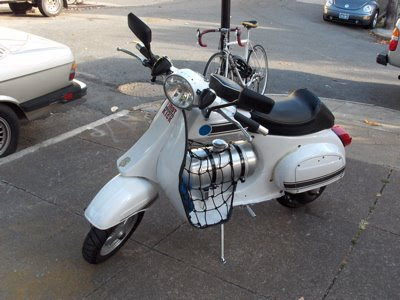 Another neat idea i saw was a long distance fuel tank, however you should take into consideration, the fuels weight, and distrubution on the scooter. The picture below is from the Cannonball Run. I have some plans myself for a Welded tank, but mine will be made of Copper and Brass, to keep that Old World Feel. Like your post very much. Would you use the LED lights for your car?